The unexpected White Thanksgiving we experienced here in Seattle certainly threw us all some curve balls. The end result at my house was that–for the first time in many years–my Thanksgiving dinner table didn’t include any of my blood relations. Brother sick, niece working, sister stuck on Queen Anne hill, nephew on the east coast….. I was surprised how much that fact bummed me out. I guess it just proves how much emotional attachment I have to this holiday! But I was thrilled some dear friends (who might as well be family) were able to join us. So that 13-pound turkey I brined and grilled out in the chilly garage certainly didn’t go to waste! But it did mean that my supplier of pre-dinner snacks suddenly wasn’t showing up with the goods. Time to improvise. Time to grab some frozen puff pastry out of the freezer. You DO have some puff pastry in the freezer, right? No? Well you should. It’s one of the cook’s very best-best friends. Need a dessert in no time flat? Cut it into squares, add a small mound of jam to the center of each, fold over, pinch edges and bake. Voilà, turnovers for dessert! Or, in the case of a dinner party with no cocktail-hour snacks, in a matter of minutes you can have these puppies in the oven and be serving your guests an elegant nibble sooner than you can say “where’s that bag of Doritos?” Who needs Doritos when you’ve got these? Now, I realize that some–if not most–commercial puff pastry sheets come folded up in little packets. Which, ideally, should be thawed slowly in the refrigerator to maintain the dough’s integrity. Those folds are pretty brittle in frozen form and you risk breaking the dough rather than unfolding it if attempted while still chill. If you try to thaw it too quickly–like at room temperature, maybe under the hot lights of your stove?–the dough becomes pretty soft pretty quickly and the layers risk sticking together. So those commercial packets only help so much in terms of spontaneity. My answer? I buy puff pastry in flat sheets that thaw in a matter of 15 to 20 minutes on the counter. No worry about persnickety folds. I happen to find mine at Big John’s PFI in Seattle, a beloved destination for all types of specialty foods from bulk cranberry beans to vanilla extract and amazing cheeses. Check out specialty or gourmet food shops in your area; an added bonus may be finding all-butter puff for the very best flavor. I always pick up a sheet of puff pastry when I’m at PFI, whether it’s officially on my shopping list or not. As is the case with about half the things in my cart by the time I’m checking out. Some cool cookie from England. San Marzano tomatoes. Quince paste. Loads of things I didn’t know I needed until I got there….. So, Thanksgiving morning, I pulled that emergency puff pastry out of the freezer. After a bit of distraction from other dinnertime prep, the sheet was thawed. I beat an egg with a bit of salt in a small bowl and lightly but evenly brushed the surface of the dough with the egg, creating a foundation for the next step. (Egg works best, but a light brushing of water or melted butter will do in a pinch.) I then grabbed a few jars from the spice rack. 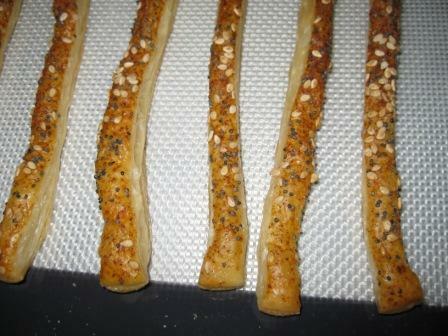 In this case sweet paprika, poppy seeds, sesame seeds. But it could just as well have included cumin (ground or seeds), fennel seeds, curry powder. Two or three items that add aroma and flavor is what you’re shooting for. Quickly sprinkled a relatively even dusting of each over the dough, then grabbed my handy pizza cutter. The rolling blade makes really easy work of cutting strips from dough in cases like this (or making lattice for a pie topping, any similar situation). Arrange your 5-minute creations on a baking sheet that’s lined with a silicone baking mat or parchment paper. 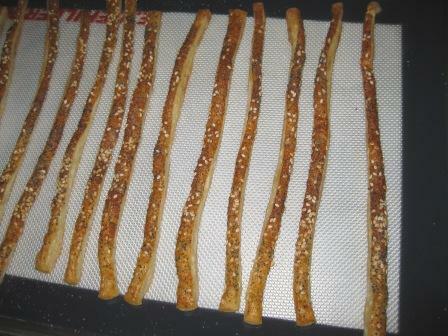 Bake in a 400 degree oven until puffed and nicely browned, 5 to 7 minutes. Let cool a few minutes, pop them into a tall glass or other serving dish. 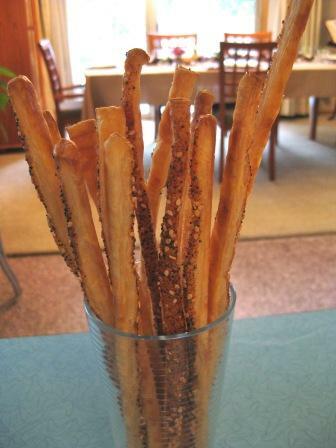 And friends will marvel at your creativity and start feigning guilt after they reach for the third or fourth one of these easy-to-love pastry straws. Matter of fact, you might want to bake up two puff pastry sheets’ worth. They’re going to go fast!